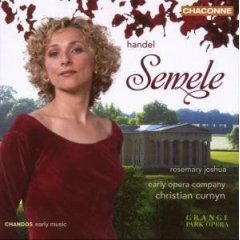 This year we are delighted to congratulate the Early Opera Company, Christian Curnyn and Chandos Records upon the award of first prize for their delightful recording of the music drama Semele. One of Handel’s finest and most charming theatre works, Semele has long awaited a complete recording of Handel’s first performance version performed on period instruments and with an ideal team of expert baroque opera singers. Members of the panel concluded that this is a hugely important addition to the Handel discography, but also that it is a sheer sensual delight: Rosemary Joshua, Hilary Summers and Richard Croft provide singing that is both stylish and charismatic, the chorus and orchestra of the EOC perform vivaciously, and Curnyn’s expert direction from the harpsichord has a completely natural feeling for the right tempo and maintains a fine dramatic momentum. This performance is fresh and direct, yet it is also subtle and shows an impeccable awareness of Handel’s notation and contrasting sentimental characterizations. We hope that the success of Semele encourages the Early Opera Company and Chandos Records to further explore baroque vocal music. The panel of judges also congratulate this year’s close runner-up: As steals the morn by Mark Padmore and the English Concert (Harmonia Mundi USA), which is a thoughtful exploration of some of Handel’s finest arias and extended dramatic scenes written for the tenor voice. The panel of judges acclaimed Padmore’s beautiful and sensitive performance, in which he clearly has only respect and love for the music, which is matched with exquisite tenderness and intelligence by the English Concert. We also highly commend two more recordings: a lively dramatic premiere recording of Handel’s first performance version of Tamerlano by the Greek conductor George Petrou and the Orchestra of Patras (Dabringhaus und Grimm), and the second volume of La Risonanza’s excellent series of Handel cantatas (Cantate per il Cardinal Ruspoli, Glossa). It has been a particularly good year for commercial recordings of Handel’s music, and the panel hopes that all those nominated for this year’s prize will be encouraged to continue producing fresh insights into Handelian repertoire. What is The International Handel Recording Prize? It is an annual award given to one distinctive new recording of Handel’s music. Hitherto known as The International Handel Recording Prize, it is chosen by a specially invited panel of respected scholars and journalists who each possess a special and informed interest in Handel’s music. 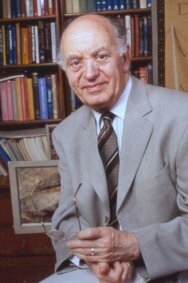 One of the prize’s founder panel members was the scholar, author and critic Stanley Sadie, and in 2005 the prize was renamed in his memory: we continue to hope that this prize is warmly accepted as an appropriate legacy of Stanley’s unusual ease at mingling enjoyable journalism and superb scholarship together. In some respects it was influenced by the now defunct American Handel Society Recording Prize (1991–1998), but in 2002 an international panel of judges inaugurated a broader forum to nurture recognition to a new recording of Handel’s music of noteworthy quality. This year’s winner was chosen by judges from Australia, France, Germany, Italy, Japan, Russia, England and the U.S.A. The winner is carefully selected from a comprehensive list of all new recordings of Handel’s music released during the previous calendar year. The winner must satisfy tough criteria: it needs to combine fine interpretive quality with a penetrating or valuable insight into Handel’s genius. Thus this Prize is an indication of a recording’s quality and the significance of its contribution to Handelian knowledge. Stanley was particularly fond of Semele, writing about it for the New Grove Dictionary of Opera, and we imagine that he would have been delighted that a fine recording of this particular work has received this year’s award. The International Handel Recording Prize was inspired by The American Handel Society's Recording Prize. The AHS Recording Prize was awarded on an annual basis between 1991-1998.